This is a previously unpublished, hand-written review of 1982's "3x5 Character Set" tutorial by H.A.R.D. The tutorial explains how to create a 3x5 character set with BASIC. It includes a type-in BASIC program listing. The original review is part of the Bob Fabris Collection. 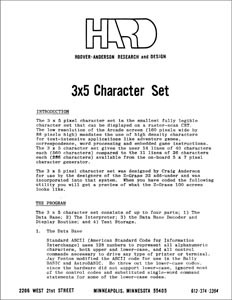 The 3x5 software character generator by Hoover-Anderson Research and Design is well documented (14 pages), easy to implement, and works. The program is written in the BASIC language and will work with either Bally or Astro BASIC. The software has some value in illustrating BASIC graphics programming techniques, but because the characters are formed using the BOX command to display each pixel of the 3x5 dot matrix that describes the character, it operates rather slowly. A database of 64 words is used to define the 64 characters in the 3x5 set. The data can be stored in the @ array of Bally BASIC, the * array of AstroBASIC, or in any add-on memory. To be of any practical use, the character generator should be written in machine language as suggested in the documentation. An example of a useful 3x5 software character generator written in machine language can be found in the Machine Language Manager cartridge by The Bit Fiddlers. 3x5 Character Set - The complete 14-page tutorial by H.A.R.D. 3x5 Character Set BASIC Program - This 300-baud Bally BASIC program will display the 3x5 character set.